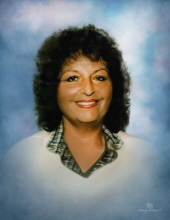 Dorcas Marcia Gomez was born on March 22, 1936, in Depue, Illinois, and passed away on March 26, 2019, in Lake Charles at the age of 83. Dorcas had the distinction of being the first woman Park Ranger in the state of Illinois. She was a homemaker and enjoyed painting with oils and water colors, quilting, and gardening. Mrs. Gomez was preceded in death by her parents, Glenn Gibson and Eva Hill Gibson; son, Keith Moore; and daughter, Dawn Barto. sisters, Clara Oloffson and Diana Carls. Words of comfort and encouragement for the family and friends of Mrs. Gomez may be left at www.jeanesfs.com. To send flowers or a remembrance gift to the family of Dorcas Marcia Gomez, please visit our Tribute Store. "Email Address" would like to share the life celebration of Dorcas Marcia Gomez. Click on the "link" to go to share a favorite memory or leave a condolence message for the family.